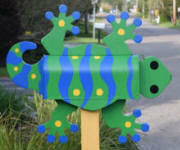 Our Unique Tropical Animal Mailboxes and Sea Life Animal mailboxes will NOT be found on any other website!!!! EXCLUSIVELY at MAILBOXES and STUFF! Our custom made Tropical mailboxes are Hand made and Hand Painted by husband and wife team, Susan and Bill Harrison who pride themselves in their HIGH QUALITY workmanship! Our fun Pink Flamingo , Beautiful Snowy Egret and Great Blue Heron mailboxes are Popular all over the country ! Our unique animal mailbox collection also includes a colorful Toucan and Macaw , in either Scarlet or the popular Blue and Gold. 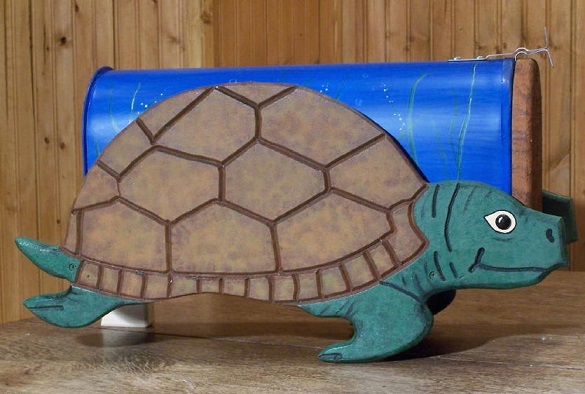 Going under the Sea, our Animal mailboxes include a cute Sea Turtle, beloved Manatee, a Dolphin and three different beautiful Tropical Fish Designs, where YOU get to select up to 3 colors ! Our "Crusty" Animals include 3 WHIMSICAL original designs for a Lobster, Red or Blue Crab and even a cute Shrimp ! Our fabulous fantasy Mermaid comes in your choice of "suit" color and hair color ! For our Scuba Diving Fans ,, we created a UNIQUE Scuba Diver , your choice again of Man or Lady and hair color ! A few other Tropical or Nautical designs include a Frog, Snail, Gecko, Alligator or Crocodile, Sea Horse, FLIP FLOP and of course a fun Sailboat , Again you get to chose your colors !! 19 Long x 8 3/4 tall x 6 3/4 wide. They are hand painted with Behr Exterior paint ( several coats) and have a tough outer coating that will last for years. Click on the Tropical Fish link to see some of the designs I have created for this mailbox and the COOL COLOR options available! 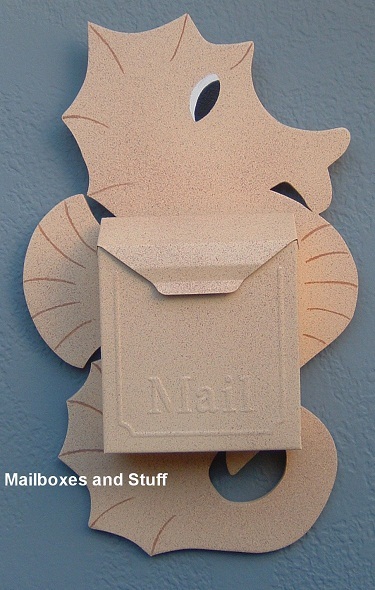 Our fun Scuba Diver mailbox can be painted with Blonde , Red, Brown or Gray hair! OR order as a LADY Scuba Diver! Tell me what color you want YOUR Sea Horse mailbox painted ! Looking for a unique Fish Mailbox ?